Kitchen remodeling projects are complex operations that require not only careful planning in advance, but also know-how and experience when executing the various work processes. With the following tips, we would like to help you evaluate your needs and weigh your options before starting any remodeling project, so that you can enjoy your beautiful new kitchen for a long time. When thinking about your new kitchen, the most important aspect to consider is functionality. First of all, you will need to decide what you will use the kitchen for and focus design on practicality. After defining function, you need to decide about the general style of your kitchen as well, the color of the walls, of the flooring and of the furniture, as well as the type of materials to be used. Most people who decide to have their kitchen remodeled do not have really well-defined ideas about what they want. If this is your case as well, there are numerous resources you can turn to if you want to find great and creative kitchen remodeling suggestions: professional magazines and home design publications, online forums, blogs and specialized websites, all come with photos and excellent design ideas. After you have a more specific idea about what you want, it is time to elaborate the plan in more detail. Kitchen remodeling requires financial effort, so the money you can afford to spend on your kitchen will largely define your material choices. First of all, you will need to determine the volume of the remodeling: do you want a simple facelift for your kitchen that implies only minor modifications like painting the walls or changing the handles on the cabinet doors, or would you like to change the appearance of your kitchen completely and have large-scale structural modifications involving completely new appliances as well? You are not required to know exactly how much each item costs, but you need to have a general idea about the material costs and be aware of differences in price: marble, for example, is more expensive than plastic materials, or oak is more costly than pine. 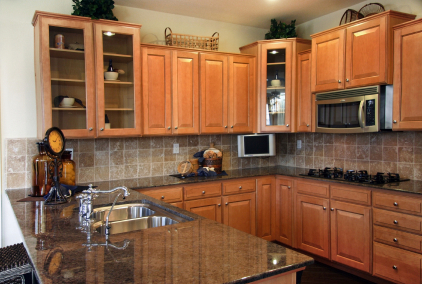 Kitchen remodeling is best done by professionals. You can do some minor modifications yourself if you are into DIY projects, but the complexity of an integral remodeling project is best addressed by experts. Kitchen designers will not only create the looks you want on paper, but they can usually recommend you reliable contractors to actually do the job as well. The costs of these services are somewhat higher than buying ready-made items from big-box retailers, but professionals will know whether your plans are viable or not, and they can make some really valuable cost-saving suggestions that will not compromise quality or the unique design you have in mind. The kitchen is usually the focal point of all the action going on in the house. Whatever the size and the shape of your kitchen is, you can surely make the best of it with the right kitchen remodeling ideas, adequate material choices and experienced contractors.